I’m sounding the alarm. Please heed this advice. Attention! Attention all CEOs, Human Resource Professionals, and Small Business Owners! Do Not! I repeat, do not allow your employees to read Joel Manby’s Love Works. If you have ever had the experience of riding in someone else’s car and suddenly found your own unappealing, then you can understand what may happen if your employees read Love Works. If you think your employees are dissatisfied now, just wait till they get their hands on this book. You don’t want your team to know there are leaders who are leading with love. You don’t want your team to long for something you are not giving them. Whatever you do, please don’t let your employees discover this book. Organizations that lead from love are different. They stand apart. They march to the beat of a different heart. Organizations that lead with love exhibit traits like patience, kindness, trust, unselfishness, truth, forgiveness and dedication. Your employees would be thrilled to work for a leader who exhibits patience. A leader with patience will engage differently in discipline and take the necessary time to offer meaningful praise. Employees know they mess up, what they don’t know is that there are some environments where when they are admonished it is done in private and not in public for all to see. You don’t want your team to know that discipline can be given with dignity. Furthermore, if they hear of a workplace where praise is specific, and not thoughtless and general, they may want to go and work there. Employees crave workplaces where kindness comes standard. If your employees ever find out that it is possible to have leaders who are kind, you are trouble. Once they find out there are leaders who know the names of their employees and who actually greet them as they pass in the stairway, oh my, are you in big trouble! If your employees get a hold of this book they may even expect a personal note from you about something special they did which you observed. Employees long to be trusted. What would happen if your team discovered there are leaders who value the input of the team members? What would they do if they found out there are leaders who listen and don’t interrupt them when they offer ideas? What if they found out it is possible to work in a place where they can make decisions for which they are responsible? I can tell you what will happen; they will jump the fence to the greener pasture. Employees would be delighted to serve an unselfish leader. Employees don’t necessarily desire leadership that thinks less of themselves, but leadership that thinks of themselves less. Greedy owners and leaders turn-off employees, but leaders who “care and share” rally the workforce. Servant leadership builds synergy which bonds the team. Selfish leadership encourages exodus…especially when employees know there unselfish leaders in need of great employees. Employees desire a work environment characterized by truth. Employees want to be able to freely share concerns without the messenger being shot. They want to work were leaders do not avoid the tough conversations needed to keep the organization moving forward. They want leaders who are open to hearing the truth about their personal shortcomings. Once your employees find out there are work environments which welcome truth at all levels, watch out and watch them leave. Employees value leaders who know the meaning of forgiveness. Even the employees with the best intentions will fail through wrong actions, poor decisions or failure to act. There are leaders who understand this and will evaluate each situation to determine if it is a pattern or a one-time offense. Great leaders know when to forgive and great leaders are known for “being slow to fire and quick to forgive instead of quick to fire and slow to forgive.” Employees who feel any error will result in castigation will certainly look for employment where humanity is acceptable. Employees yearn to work where leaders are dedicated to the stated values. Most organizations have wonderful and lofty values, but the words often becoming meaningless when circumstances become difficult. Employees want to see leaders who exhibit love even when difficult decisions must be made. They want to be a part of organizations that treat people fairly even when conditions call for reductions and change. Organizations that lack congruency in their actions and stated values will lose their grip on their workers. Of course, if you and your organization lead with love, then you have no need to worry. By all means, encourage your team to read Love Works. It will reinforce, substantiate and encourage the positive behavior taking place in your organization. However, if you don’t lead with love, I encourage you to take a look and discover the compelling alternatives to leadership as usual. You, and your team, will be glad you did. 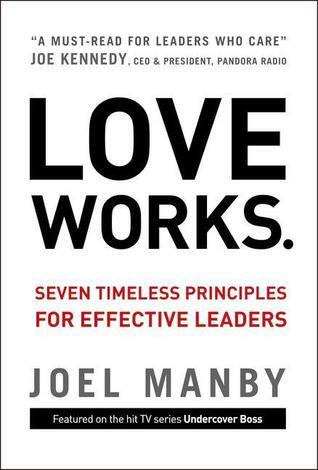 Love Works is written by Joel Manby, CEO of Herschend Family Entertainment. To read more about these principles in action see Stone Mountain Park: A Lesson in Transforming Corporate Culture. Note: Any advertisements found on this page are placed by WordPress and not by the author of this blog post. Your employees will share the legacy of a company – it is like enthusiasm, it is contagious, whether the leader likes it or not.